This is the deck for a presentation I had the pleasure to present in multiple forums over the last year. It’s a short introduction for Oracle personal (DBAs and DB Developers) to the Big Data challenges and solutions. This presentation is focusing on the Hadoop Ecosystem but also shows other solutions – such as Apache Spark. This is things every DBA needs to know, and not EVERYTHING a DBA needs to know. This is only an introductory to the subject. I also have a 200+ slides deck for getting the in depth view. If someone find this interesting and want to read more, feel free to contact me and I’ll post the longer deck as well. What is the Big Data challenge? Where does the DBA fits in? This presentation was presented in BGOUG 2016, ILOUG Tech Days 2016, HROUG 2016 and DOAG 2016 Oracle user groups. I also presented this in smaller, more private sessions. This is the presentation I used for the Oracle Open World 2016 – it’s about SQL and more specifically about analytic functions and other advanced techniques. Oracle Open World was one of my biggest aspirations for a very long time. Ever since I become a junior DBA I’ve heard of this conference but never thought I’d actually get to speak there. For the last 3 or 4 years, I’ve been submitting my papers to the Open World CfP – and was never accepted. Last year, I started to make my appearances at the different user groups meetup in the EMEA region. In June, I had the pleasure to sit down and talk to few user group leaders. From them, I learned what I can do better in submitting my papers and what kind of session I should aim for. I followed their advice and indeed, I was accepted to present at the Open World (on the User Group Sunday – which, in my humble opinion, is the best day of the conference – with little to no marketing agenda). So without feather ado, here it is. My first presentation at the Oracle Open World ever. The topic was Advanced SQL Techniques (analytic functions, grouping function and so on). This presentation also present couple of Oracle 12cR1 new features (since 12cR2 went out after OOW). This is part of a bigger presentation I usually give in a full day (I will post it as well soon) – that presentation also include newer features from 12cR2. Thanks to Tim Hall for organizing this day – I’m happy to give back to the community which has given me so much. My favorite feature is with no doubt is the Data Guard. Even though the Data Guard feature might looks like an excess of other features (redo log for recovery, archive log for backup) it is one of the more awesome features in the Enterprise Edition database. For those of you who don’t know what I am talking about – Data Guard is the disaster solution feature for the Oracle Database. This feature has been around since Oracle 7 (under the name Standby Database), but in Oracle 10g it had a major change: for the first time there was a way to create disaster recovery solutions, which actually had ROLES in them! On the first or second year after I became a DBA (somewhere in the year 2000, give or take), I heard about this magical event that is taking place in the Oracle realm. All the top Oracle DBAs and professionals in the world (and maybe a couple of unicorns, I’m not sure) are gathering in a small but beautiful village by the name of San Francisco – and talk about databases. I found this story unbelievable – but I knew I must go there. I was about 20 at the time, so going around the world for a conference was out of the question – but the idea of a big convention sounded awesome to me. 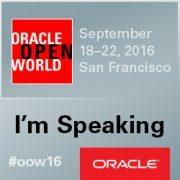 When I went to my first local Oracle event, I was so amazed and knew that no matter what – I will someday go to the Oracle Open World (OOW). Years gone by and I evolved – from a programmer and DBA to a senior DBA, team leader, senior consultant, service director, and even CTO for a consultancy company – but I never had the chance to go to that Open World event.